French Toast is one of my all time favorite breakfast recipes but the additional calories from egg yolks, butter, milk and syrup used in traditional recipes can add up to 550 to 1000 calories per serving. Just 1/4 cup of maple syrup is 210 calories and most people use at least 1/2 a cup of syrup on their French Toast which is 420 calories. 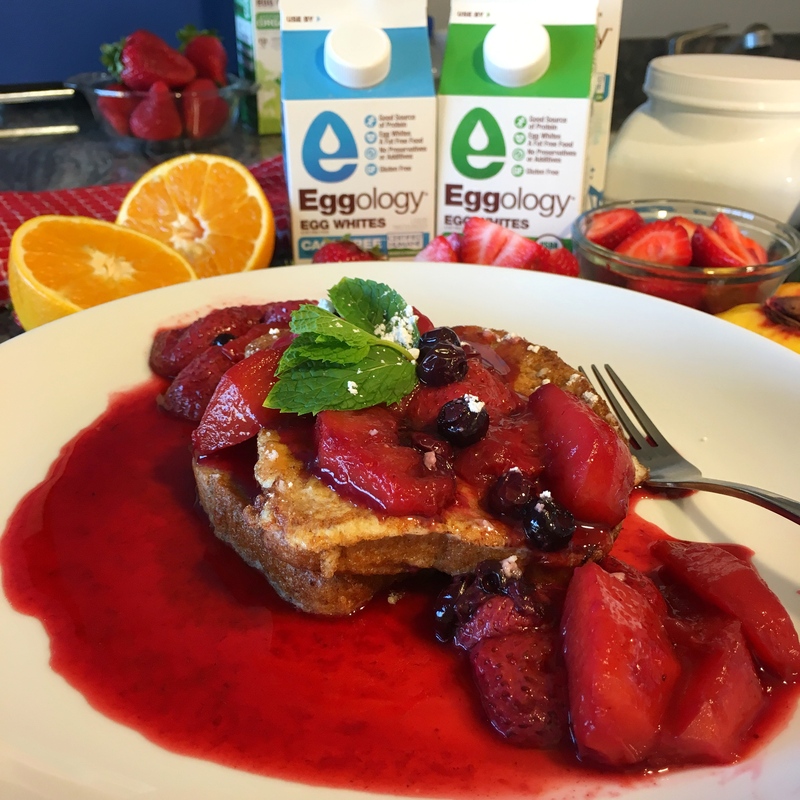 Try this delicious Eggology Egg White French Toast with Peach Berry Compote! 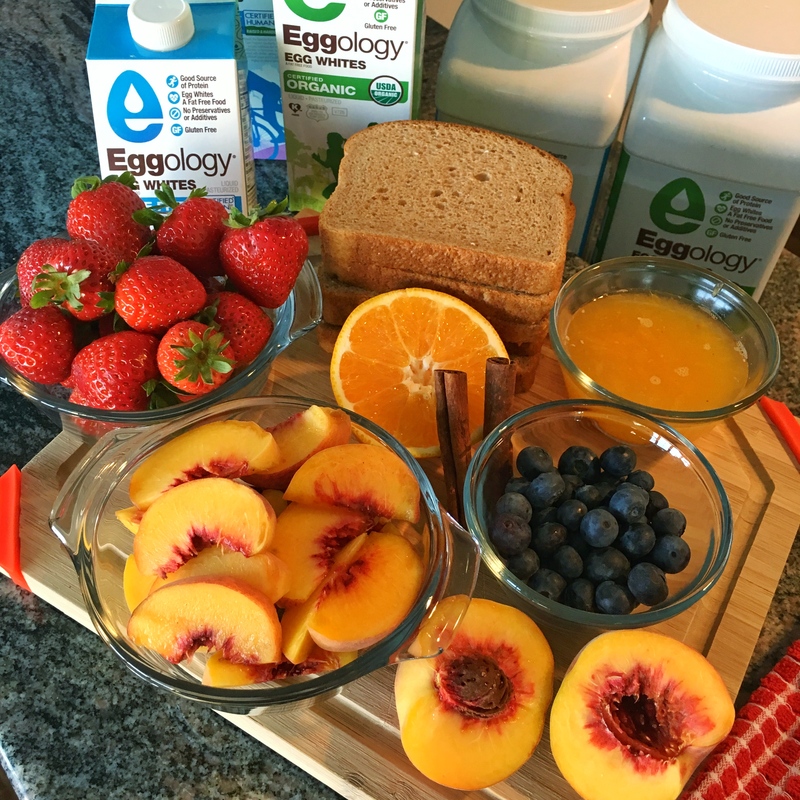 Just substitute organic whole wheat bread for the usual white bread, use some Eggology Liquid Egg Whites to pump up the protein, and top with a fresh peach berry compote instead of syrup. One serving of two slices of French Toast with 1/2 cup of peach berry compote is only 318calories and 20grams of protein. Can you say Guilt Free French Toast! We’ve added this yummy recipe to The Hollywood Trainer Club! Try it! You can find this recipe in the Meals section under Recipes A-Z just type Eggology Egg White French Toast with Peach Berry Compote in the search box & you’ll find it! Stir continuously over medium heat for 8 to 10 minutes. Place each piece of bread into the mixture for 30 to 60 secs. This recipe is also in the club with over 135 more healthy delicious recipes and weekly meal plans. Log into the club www.TheHollywoodTrainerClub.com click Meals then Recipes A-Z then type in Eggology Egg White French Toast with Peach Berry Compote.